And I think I forget that. I say, quite off-hand, “Oh, I’m writing about the war,” as if there is only my war, my book war: World War 2. Of course, there is not. We are at war. The more I learn about “my war” the more I learn that nothing is as simple as I thought. But then, when we started our current war I still saw things quite simply. I waited for Hans Blix to tell me what was the right thing to do. It was never about Tony or George for me, but I did believe that some wars had to be fought and if Hans Blix said we needed to go to war, that was good enough for me. I can see now that I was blind-sided. I bought the white wash. I bought the propaganda. Shame on me. 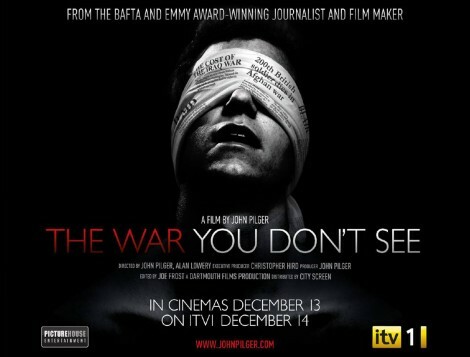 If you follow me on Twitter, you will know how struck I was by watching John Pilger’s film, The War You Don’t See. Truly harrowing viewing, but essential, if only to bear witness. There were a number of arresting statistics in the film, but this one in particular has stuck with me: In WWI civilians were 10% of total deaths. For WW2 it was 50%. Vietnam, 70%. This war, now: 90%. I’m no good at maths, but even I know that figure is obscene. John Pilger has also been in the news discussing Julian Assange while he was being held in HMP Wandsworth and hoping for bail; Assange features in Pilger’s film as well, for it is Wiki Leaks who is attempting to poke a pin in the rhetoric and justification of this war and to show the truth lurking behind the propaganda. If there is any form of Wiki Leaks for WW2 it is Nicholson Baker’s “Human Smoke: the Beginnings of World War II/The End of Civilization” published in 2008. 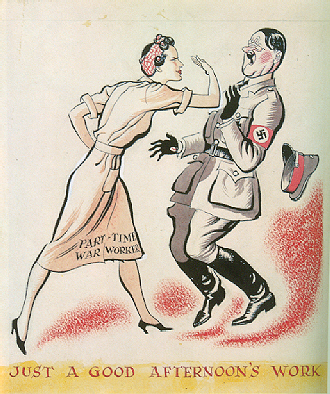 Using primary resources, Baker juxtaposes newspaper and radio propaganda with memoirs and diaries to lay out the arguments for starting the war, both in the UK and the US. I am using primary resources for my own research, from the Hansard House of Commons sitting notes to interviews made by myself and by the Imperial War Museum, so I am doubly grateful for Baker’s authentic and holistic approach to supplement the history books. Further, I am grateful for his critical eye. There is no good war. That is what I know now. If you want a better perspective on today’s war, please visit John Pilger’s site, where you can read about The War You Don’t See and find a link to watch it again on itv.com or hear a recent interview on Radio 4 – sorry, UK only. Well, here in Edinburgh it’s been more of a whiteout, as snow and ice have kept the faint-of-heart indoors. I emerged like some premature gopher yesterday after two days inside. I watched men holding ski poles fall on their heads on thick slabs of ice that covered any footpath not salted or gritted. I walked home, knees bent, hunched as an old woman, skidding my way down to Canongate. So, you’d think I would be getting plenty of writing done? I am, actually, thanks. Up to 15K since arriving here and taking up residence at a small table beside a radiator. It’s pretty fast writing statistically, I suppose, but it feels slow to me, if only because the research for this book has been with me so long, and because I currently have so much time in which to do it. You will have seen my earlier pictures of research materials I was bringing up with me. They are all now unpacked and waiting for me to read them. But there are a couple of things I forgot… yes, I forgot my own research: transcripts, interviews, maps – all the research I have already done. Why, oh why? I’ve spent much of this morning in a tailspin of looking and looking in the same file folders to convince myself that I hadn’t looked hard enough. I had. They are not here and I cannot go home to get them. Does this mean the end of my progress? Shall I give it all up and go shopping? Of course not. The fact of the matter is that I know my story. I know the research I’ve already done and my fingers remember the transcripts I’ve already typed. I know I have internalised the research and am changing it and shifting it into new bits of story to make one that is truly my own. I know this – and yet I want the safety blanket of this paper, this proof that I know my stuff as a kind of signpost for when I get lost in my narrative. For when I can’t see where I’m going. Research is a really important part of writing, whatever it is you’re writing. When dealing with history it is all the more important, though there are plenty of writers who will say they just write and factcheck later. I guess I have to put a blackout on my desire for my research – I have to stop looking outward for what I’m worried I can’t remember or will get wrong and trust that it’s all already inside, glowing. I don’t need more of what I already know – but that won’t stop me looking for all I still have yet to learn! I couldn’t remember when blackouts went up, and many fine websites told me they went in 2 days before the war started, September 1939. That doesn’t work for my story, so I need to know the history – know the truth – and then write why something different is happening in mine. In my case, I’m writing about hundreds of empty bedrooms on the Isle of Man. No blackouts have gone in, I say, because there are no people there to switch the lights on. Is it true? Does it matter? Only if it makes a reader stop in their tracks and think, no, that doesn’t ring true – or if it stops a writer in her tracks, trying to justify a scene. Either way, in 2005 I met a man who was a joiner in 1940 on the Isle of Man and he remembered putting up blackouts, and that really is good enough for me – even if I can’t find the transcript I did of our interview. 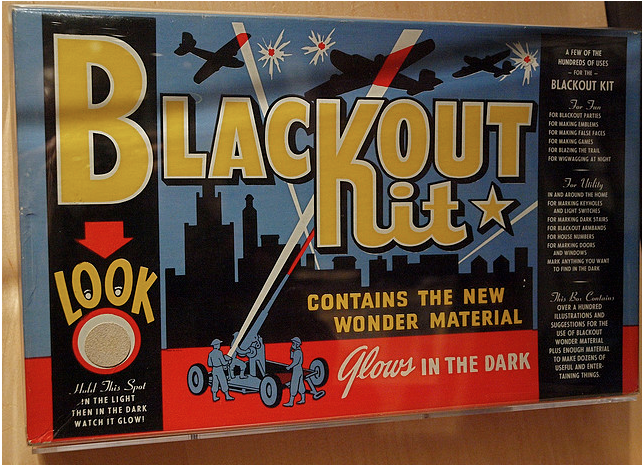 I do not believe he had access to these fancy blackout kits, but they sure would have made his job easier. The joiner, by the name, was called Swimmer back then. You will meet him in my book, some day. Now that we have settled into our temporary, snowy home I have begun my second novel, again. I was about 25K in to the last draft when I went back to rewrite the first one again, then came back, looked at what I had and that – nope, that’s not it. Scrapped. Now, with an updated Scrivener programme and a new outlook, mainly onto a snow-covered Edinburgh street, I am ready to write. Today I finished the first chapter and have hit 5K. Whoopee or big deal? It’s not a novel yet, but I know, roughly, where I’m going. And for me only knowing where I’m going gets me going, even if I change my route as I write. My next target is 10K and if I hit it I will take myself to see a Czech animated “Alice” that has been on my to-see list for a long, long time. Maybe that will get me through Chapter 2? My first novel has really short chapters because I’m bouncing around in different heads and time periods. Maybe this one will be different. This picture is a location for my first chapter. 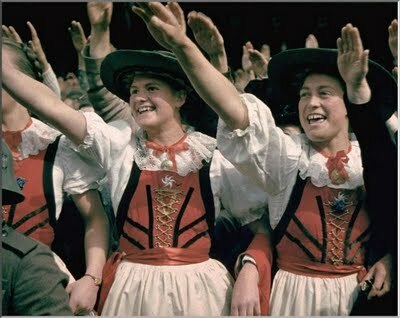 Maybe the best part about writing is the researching, and certainly when you’re telling a story that is “true.” Today I got my main character from a police cell to the locked compartment of the toy steam train in the Isle of Man, via police-lined streets and the Liverpool Stadium, where thousands of women were kept awaiting ferries in May 1940. 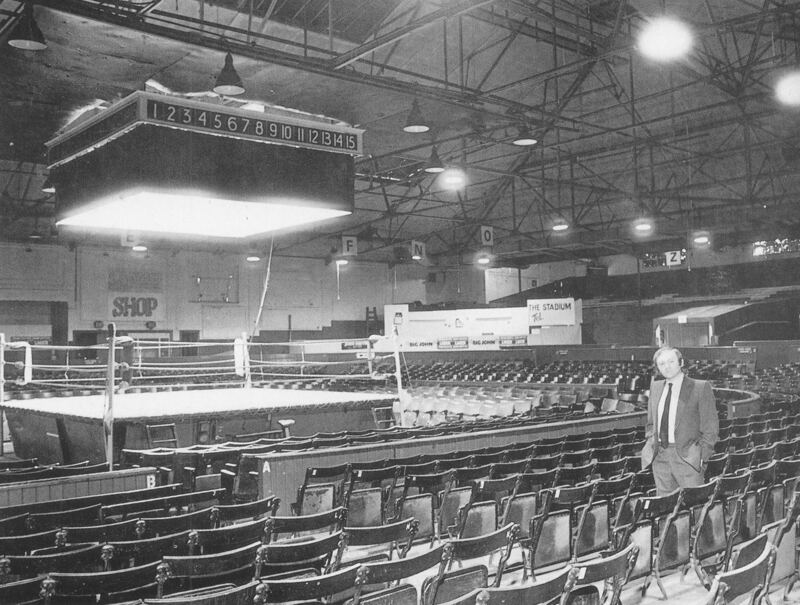 The Stadium was opened in 1932, became a famous rock venue in the 1970s and was demolished in the 1980s. I wonder what it will have been like, entirely filled with frightened, exhausted women and no men there to thump one another or cheer? But then, that wondering is the other best part of writing.